Tuesday marked a turning point for residents of Illinois’ 18th congressional district. Those residents officially lost their congressman, Aaron Schock, who resigned two weeks ago in the midst of a spending and mileage scandal. They had to confront the cold reality that Schock had become the second congressman from their district who faced ethical questions over mileage. Back then, Lincoln represented much of the same area, in the old seventh district of central Illinois. In 1848, he became mired in a mileage scandal which tarred not just the Great Emancipator, but every other member of congress. "Everybody who was named, which was everybody who was in the House at the time, felt personally accused," said Scott Klein, who researched the 19th century scandal for the investigative site ProPublica. "He’s not singled out more than any other congressman." The instigator was Horace Greeley, powerful editor of the New York Tribune, during a brief period where he also served as a member of the House. Greeley had become outraged at what he felt were excessive mileage payments to his fellow congressmen. "He was the recipient of some $677 in excess mileage, at least according to Greeley’s calculation," Klein said. "Which is the equivalent of $18,700 today." At 40 cents a mile, Greeley saw the payments as a relic from an earlier time. The rate had been calculated during a period when it was assumed a traveling representative could only put in about 20 miles per day. Using an official book of mail routes, Greeley instructed a reporter to calculate the shortest path from each congressman’s district to Washington, and compared those distances with their actual payments. He published his results in December of 1848. "He was trying to expose a corrupt system," said Lincoln expert Bjorn Skaptason, at Chicago’s Abraham Lincoln Book Shop. "Congressmen did not get paid a large salary back in those days. They got paid when Congress was in session. And Congress, of course, was not in session very long." "One of the principal sources of income for somebody who was putting a major part of their life on hold to go to Washington and represent the people was this mileage," he said. Like Klein, Skaptason notes that during the Lincoln era, times had changed. A congressman from Illinois would no longer simply ride a horse along those published postal routes, but had benefit of railroads, or even steamships to make such a long journey. "All of these would add enormous miles to the trip, but the trip would be faster," he said. It should be noted that Greeley did not directly accuse the congressmen themselves, but rather the system of payments. He directly said so in his published investigation, but that distinction was lost on those whose names were printed in the tables. If Lincoln ever answered the charges, history does not make note. 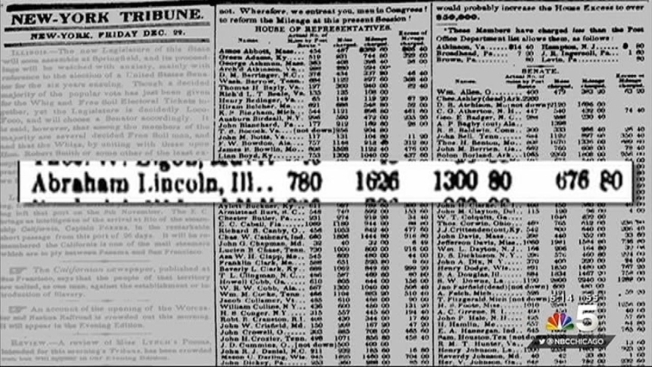 While outraged members of congress sought to censure or even expel Greeley, there is no record of Lincoln even speaking during the floor debate. ProPublica’s Klein points to the Greeley investigation as an early example of modern data journalism. He took Greeley’s numbers, sorted them through an Excel spreadsheet, and re-analyzed the data. "I found it absolutely full of arithmetic errors," he said. "One congressman is left out, and most notably, Greeley himself is not listed among members of Congress who took excess mileage." The editor-turned-congressman was paid $5, which he returned to the Sergeant-at-Arms. And the mileage rates? Klein said that shortly after Greeley’s expose’ the House voted to reform the numbers. But in his autobiography, Greeley argued they did so knowing full well that their colleagues in the Senate would never ratify the changes. It's all evidence that while news cycles have shortened, some of the scandals of the modern era are actually rather familiar.